A highly uncomfortable textbook French farce that never lets up on the laughs. Made for fans of farce that like Paul Rudd, Steve Carell and Jemaine Clement. 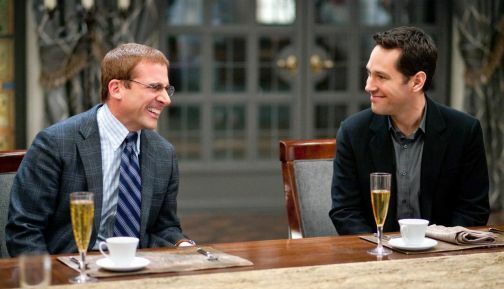 If you are not a fan of farce, then don’t even think about seeing Dinner For Schmucks. It has everything you need in a farce – it starts off normal, then gets wild. There is word play, innuendo, physical screwball humor, mistaken identity and whole lot of gags that will make you squirm in your seat. Like director Jay Roach’s previous movie Meet The Parents, it will drive you crazy – but in a good way. Tim Conrad (Paul Rudd, I Love You, Man) is an average guy. He works an average job, has an average life and an average relationship with an above average girl – but he wants more than the average guy is willing to settle for. Tim wants to marry his amazing girlfriend Julie (Stephanie Szostak, The Devil Wears Prada), get a huge promotion at work and have a better than average life. This is his one fault and it just might be cause of his demise over the next couple days. Tim has asked Julie to marry him a couple times now. She doesn’t say “no,” she just says “not right now.” In his mind, if he gets the bigwig promotion she will say “yes.” All he has to do is land the promotion. After taking a risky chance at impressing the bosses, Tim catches the attention of head boss Lance Fender (Bruce Greenwood, Star Trek) and is in consideration for the position. Now being in Fender’s good favors, Tim is invited to join Fender and the other bosses for a special dinner they call “Dinner For Winners.” The purpose of this dinner is for each person to bring the most unique “idiot” (or schmuck) that they can find, laugh at them and not with them, and the person who brings the biggest idiot wins a trophy. Even though the idea is outside of Tim’s personal morals, he knows that he must participate in order to gain their trust and earn the promotion. Because Tim believes that “everything happens for a reason,” when he just-so-happens to hit an idiot with his car, he jumps at the opportunity to invite him to the dinner. But this isn’t your average schmuck – this is Barry (Steve Carell, The Office), a “tornado of destruction.” Always with the best intentions in mind, Barry ruins everything. And I mean everything. If you know that you are going into a farce – meaning that you are intentionally going to be driven crazy – then you will enjoy every nerve-wracking minute of Dinner For Schmucks. If not, you will be caught off guard and possibly hate every minute of it. While the majority of the entertainment comes from the jokes, gags and uncomfortable situations, none of them would be entertaining without the fantastic cast. Rudd brings an honest, average guy feel to his character that makes it easy to connect with him. His intentions are good. Even though you wouldn’t think it from the trailers, Carell plays more of a straight man than a pure idiot. He, too, has good intentions – he’s just an idiot who doesn’t think before he acts. Szostak’s Julie is one hundred percent lovable. Because of that, you know exactly why Tim is doing everything that he is doing. Other notable supporting roles are played by Jemaine Clement (Flight Of The Conchords), Zach Galifianakis (The Hangover), Lucy Punch (Hot Fuzz), Kristen Schaal (Flight Of The Conchords) and Ron Livingston (Office Space). If you find humor and entertainment in uncomfortably awkward comedies (like Ricky Gervais’ original version of The Office and Extras), then Dinner For Schmucks is right up your alley.